Robust with aromatic traditional Indian masala spices. Soothe the senses with these exotic instant tea potions created with the finest imported Black and Green Teas blended with sweet honey, non-dairy creamer and intoxicating spices from the East, including Clove, Cinnamon, Ginger and Cardamom. Great for tea on the go. These easy to fill, chemical-free, fully biodegradable tea filters can be used in any cup, mug, or pot to make your favorite loose tea or herbal infusion. 12 per case — 32 oz. 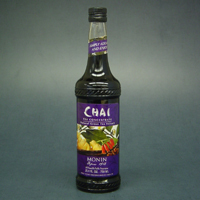 Big Train Spiced Chai is a creamy blend of honey, vanilla, black tea and exotic spices. Kosher Certified, gluten free, contains no hydrogenated oil and can be made with water or your choice of milk. Enjoy hot, over ice or blended. A creamy blend of honey - black tea and exotic spices.